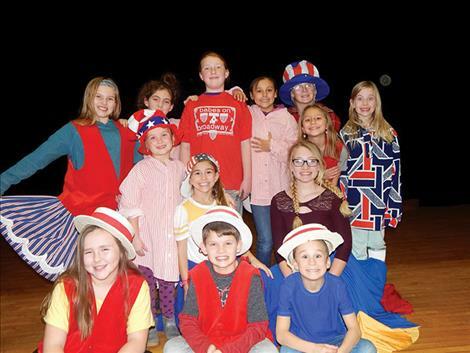 POLSON – On Jan. 25 and 26, 110 kids were involved in the “Babes To Broadway” production. 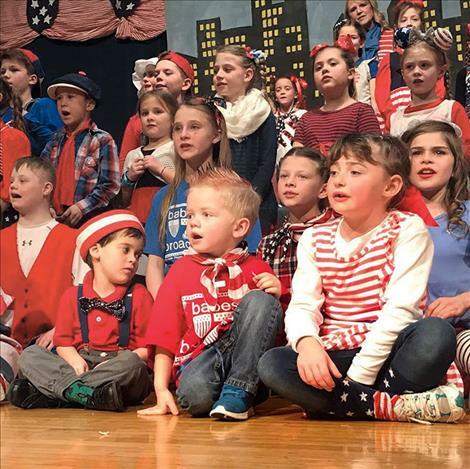 There were 55 kindergarten to eighth-grade performers in the Friday evening cast and 55 different performers in the Saturday night cast. The show was written and directed by Neal and Karen Lewing with music direction by Ronan’s Cathy Gillhouse. Desiree Alexander and Spring Johnson served as assistants to the directors. 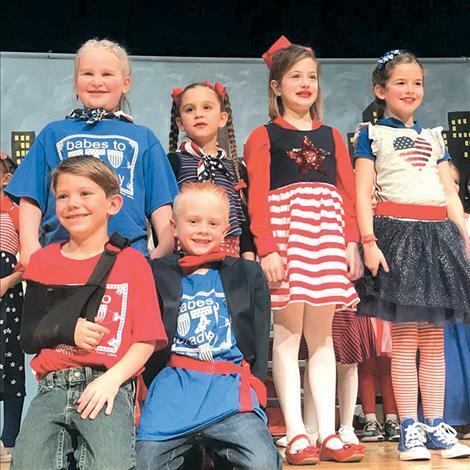 Debbie Gunlock and Jaycee Morrison from Cherry Valley Elementary School appeared with the students in both casts. This was the 35th year the Port Polson Players have produced the production for Polson students on the Polson High School stage. 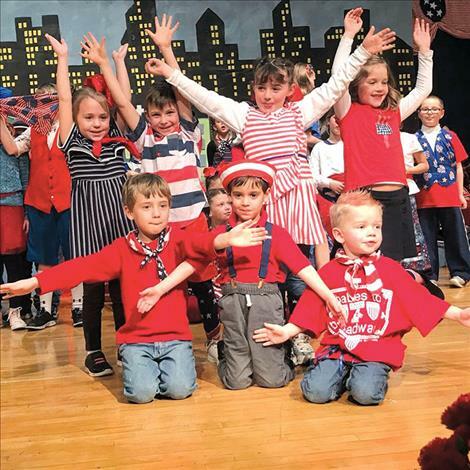 “Babes To Broadway” was sponsored by the Port Polson Players in association with Mission Valley Friends of the Arts and Polson School District 23. About 400 people saw the weekend performances. The PHS auditorium was filled to capacity for two more shows on Monday morning and afternoon. The direction assistants were Desiree Alexander and Spring Johnson. Cathy Gillhouse and Sarah Kinzle provided musical accompaniment. The backstage monitors were Bella Smith, Skyler Johnson and Autumn Curry. Lainey Johnson, Evan Kline, Rosie Lies, Dawson Nash, Elynn Bird, Elizabeth Huntsman, Trevor Montgomery, Shelly Torgenrud, Miles Lewing, Leo Reilley, Mason Combs, Elliotte Patrick, Scarlet Anciaux, Quinn Delaney, Zhoey McEvoy, Vance Means, Khloe Hamilton, Christopher Roach, Leilani Oldhorn, Jesamyn Allred, Analeigh Bryant, Aubrie Nash, Sophia Weber, Rivers Lewing, Finley Stevenson, Korbyn Brumwell, Olivia Ruffatto, Eva Kline, Madison Amy, Indica Moens, Kyler Gage, Charlotte Combs, Embree Bird, Morgan Delaney, Macy Montgomery and Kendra Brumwell. Mrs. Debbie Gunlock (Cherry Valley Secretary) played a character as herself as did Jaycee Morrison (Cherry Valley Teacher). The Friday cast included: Skyler Johnston, Autumn Curry, Ellie Dupuis, Felicity Mihara, Autumn Skillicorn, Taylea Lund, Haven Houle, Shanoah Matt, Kianna Hensley, Levi Holmen, Cameron Boxton, Kyle Alexander, Aristo Cannon, Serious Curry, MacKinzi Bartel, Kila Cannon, Ziya Walker, Ariella Mihara, Baylee Lemm, Sabra Nickol, Sophia Wood, Samantha Rensvold, Lizzie Cunningham, Abigail Sorrell, Walter Mihara, Ava Vert, Lyrick Trevion, Kayla Grainey, Molly Mihara, Colin Shirtliff, Melody Mihara, Ella Grainey, Owen Shirtliff, Aiden Takacs, Analeigh Bryant, Kimora Scott, Kalyn Koldeway, Marguerite Brinner, Jayth Thompson, Sage Wilson, Kiara Hensley, Owen Godfrey, Katherine Bartel, Annabella Allred, Araeya Onesalt, Shahea Hunter, Vivian Grainey, Maylee Clairmont, Abbi Sanford, Lara Duran, Claire Martin Benson and Aristo Cannon. Mrs. Debbie Gunlock also performed in this production as did Jaycee Morrison.